I’ve never heard of Jade Gordon before, but she sure did catch my eye at the “Harry Potter And The Deathly Hallows Part 2” World Premiere in London tonight. Tom Felton’s plus one looked gorgeous wearing a white strapless gown with a floral appliqué skirt by Australian designer Bowie. Despite the very strong bridal vibes I’m getting from this look, she sure is working it. 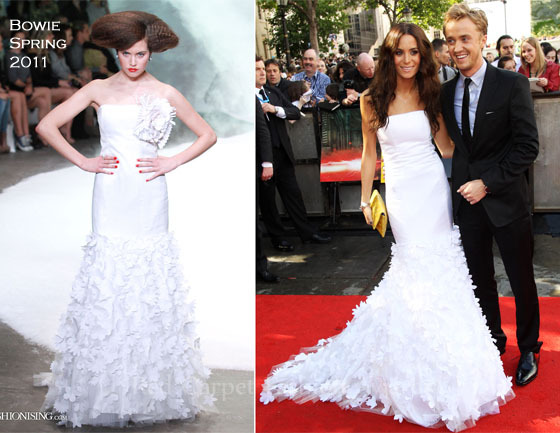 She has no doubt been inspired by our celebrity summer brides or dropping very strong hints to Mr Felton. Who Was Your Best Dressed At The “Harry Potter And The Deathly Hallows Part 2” World Premiere?